Attention-grabbing full color envelopes - YES! Short run quantities - YES! Virtually any size envelope - YES! Addressed with presort postage - YES! Imagine envelopes that say "open me first" just by printing in full color. 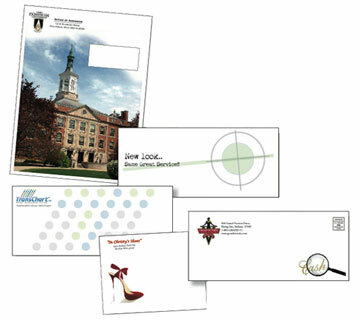 We find that open rates are substantially higher when selecting our beautiful envelope printing. You can run our envelopes back through many inkjet or laser printer without ink smearing. Our press will print photos, images, names, addresses, sort and barcode your mail for best postage rates. And, unlike most mail houses, we use the highest quality laser printing to address your mail, not low res inkjet printing. We can also print #10 window envelopes in full color. Order as few as one box of envelopes! With so many sizes and options, it's best to request a quote for your project. 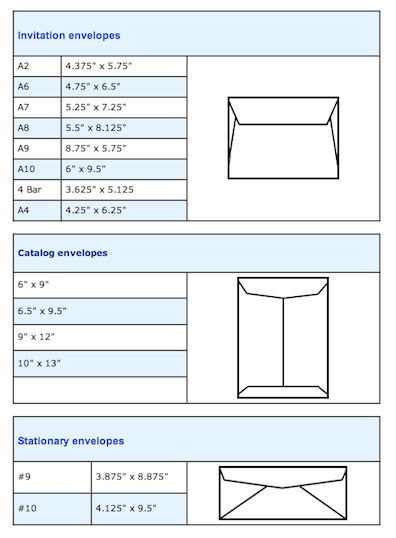 Here is a handy chart of popular envelope sizes we stock.